Polymer electrolyte membrane or proton exchange membrane fuel cell (PEMFC), where chemical energy is directly converted to electrical energy, provides a highly efficient alternative to a standard internal combustion engine. High power density, clean emissions (water), low temperature operation, rapid start-up and shutdown, and ability to use fuels from renewable sources are several reason why fuel cells such as PEMFC have attracted attention for large market applications, such as transportation. With these unique features, PEMFC will revolutionize the future energy economy. PEMFC will indirectly make water our future fuel. 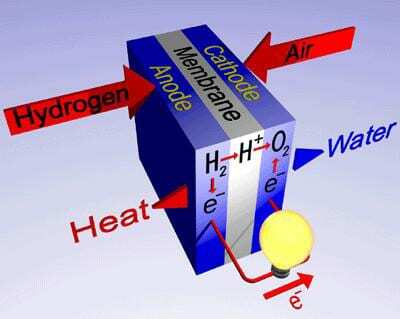 Hydrogen and oxygen generated by splitting water using photosynthesis can be used as a fuel for PEMFC. PEMFC are leading candidates to power the space shuttle and other mobile applications even down to mobile phones, however, there are still some important issues that must be resolved in order for PEMFC to be commercially competitive. It is known that splitting a hydrogen molecule at the anode of fuel cell using platinum is relatively easy. Unfortunately however, splitting the oxygen molecule at the cathode of fuel cell (oxygen reduction reaction (, ORR)) is more difficult and this causes significant polarization losses (lowers efficiency of the fuel cell). An appropriate catalyst for this process has not been discovered and as of yet platinum is the best option. Platinum is by far the most effective element used for PEMFC and nearly all current PEMFC uses platinum particles on porous carbon supports to catalyze both hydrogen oxidation and oxygen reduction .However, due to their high cost, current Pt/Carbon are not feasible for commercialization. The U.S. Department of Energy estimates that a platinum-based catalyst will need to use roughly four times less platinum than is used in current PEMFC designs in order to represent a realistic alternative to internal combustion engines (1, 2). 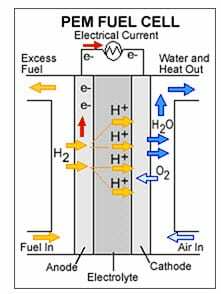 Fuel cells generate electricity by combining hydrogen gas with oxygen to produce water (figure 1). Although that sounds perfectly clean and green, that hydrogen is typically generated by “reforming” fuels such as natural gas, gasoline, or ethanol, which invariably introduces carbon monoxide into the hydrogen gas. If even minute quantities of carbon monoxide are present in that gas, it can poison the platinum catalysts that are important to driving the fuel cell. (In the heart of a fuel cell, CO binds tightly to platinum and prevents it from grabbing hydrogen, the first step in the reaction.) However, Hydrogen produced from water splitting by photosynthesis is very clean and has zero carbon monoxide. An electrolyte or membrane is used to separate oxygen gas at the cathode region from hydrogen gas in the anodic region, while ions can still migrate from the anode to the cathode. The electrolyte plays a key role. It must permit only the appropriate ions to pass between the anode and cathode. If free electrons or other substances could travel through the electrolyte, they would short circuit the current in the fuel cell and fuel cell degradation occurs. Figure 1: Hydrogen PEMFC showing the anode catalyst layer where hydrogen gas is oxidized to hydrogen ions (protons), the cathode catalyst layer where oxygen reduction reaction occurs producing water and the electrolyte ( also called membrane or polymer electrolyte) where only protons migrate from the anode to the cathode to react with oxygen. The commercial development of a special electrolyte (single ion conducting polymer electrolyte) changed the field of electrochemical devices in a significant way. Electrochemists have spent many years in a continuing search for newer, more highly conducting (ions and not electrons) and a more electrochemically stable electrolyte system. With the development of a single ion (for example only hydrogen ions in PEMFC) conducting polymer, electrochemists have the ability to choose from a variety of polymers with both high conductivity for a given ion of interest (off course hydrogen ions in PEMFC) as well as excellent stability and process-ability allowing the design of electrochemical devices (such as PEMFC) in their most ideal format (3). The broad class of electrolyte (electrolyte is a polymer and so it is called polymer electrolyte) to which Nafion (discovered by DuPont company) belong has application in a number of area of commercial importance, not limited to PEMFC. When the PEMFC reaches its eventual position as the major power generation system in a broad-based application such as automotive propulsion, these Nafion electrolytes will reach a scale of production far exceeding the current levels. This change will bring about significant challenges for companies who manufacture the electrolyte but also offer tremendous opportunity. It is likely that these future ubiquitous electrolytes for PEMFC will look different, produce much less pollution during manufacturing and cost much less than the electrolyte that dominate the commercial landscape today. Future PEMFC will have to use low grade (inexpensive) hydrogen gas, which contains impurities (e.g. carbon monoxide) that poison precious metal catalysts (e.g. platinum) only at low temperatures (less than 120 ̊ C) and reduces the PEMFC efficiency and power output. In addition to mitigating catalyst poisoning there are a number of advantages to operating the PEMFC at higher temperature and lower humidity, such as increasing catalytic activity, reducing cathode flooding and eliminating the need for external humidification equipment. However, at higher temperatures, current electrolyte that is used in PEMFC dehydrate (becomes very dry), reducing ionic conductivity ( no hydrogen ions would be able to migrate) and overall cell performance. This is because optimal operation for current PEMFC is 80 °C and 100 % relative humidity because Nafion is used as an electrolyte in these PEMFC. Thus there is a worldwide effort currently underway to find suitable alternatives to Nafion that might allow higher temperature operation and be more cost effective. In the direction of operating the fuel cell using a cost effective and non-platinum based catalyst, is the work of Canadelectrochim, based on Mother Nature idea. Mother Nature can build very efficient catalysts. Canadelectrochim is a small Research and Development company located in Calgary, Alberta had presented a mechanism for the fuel cell reaction based on Mother Nature which mimics the plant leaf. This research work was presented in the 2011 and 2012 IMRC meeting in Cancun, Mexico. This work was based on the idea that rain droplets are known to roll or bounce on the surface of plant leaves, removing dust particles and contamination. This self- cleansing action is due to the presence of a special surface layer which is composed of microscale poles. Each of these microscale poles is covered with billions of nanoscale poles. In physics it is called “Heterogeneous superhydrophobic surface”. Based on the idea that has been called hierarchical roughness, a mechanism for the oxygen reduction reaction can be easily explained. Based on this mechanism the reaction of the fuel cell does not require platinum. Hydrogen, Fuel Cells & Infrastructure Technologies Program Multi-Year Research, Development and Demonstration Plan, U.S. Department of Energy, October 2007.